There were numerous stories going around that the school we went to when we were still in shorts were used for execution of innocent civilians and allied prisoners. Stories of haunted halls and stairways were plenty. Here are some schools that were in fact Japanese torture chambers. 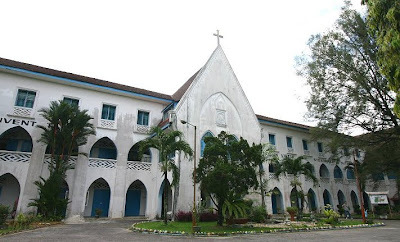 St Michael’s Institution, Ipoh – A group of Catholics missionaries arrived here in 1912 and began building a school next to the famous Kinta River. It did not take long for the missionary brothers who ran the school to have enough funds to erect a huge school building with unique French structural design. When the WW2 broke out, the school was used bu Japanese secret police as their headquarters. Needless to say, there were lots of torturing carried out. The buidling itself had many tunnels which had been sealed off and the tunnels were said to be used by the Japanese to torture prisoners and to store food. Malay College Kuala Kangsar, Kuala Kangsar, Perak – This school is said to be a former site of Japanese occupation camp during WW2. Victoria Institution, Kuala Lumpur – The boys school was turned into a Japanese base during the Occupation. Many British soldiers and locals were brutally tortured to death in the basement and some older buildings on the campus. The Tuanku Muhammad School Kuala Pilah was used as the headquarters of the Japanese Kempetai (or secret police), how hundreds of people had been tortured at the school, and how over three hundred mainly Chinese victims lay buried in the small rubber plantation at the back of the school. King Edward VII School. Taiping. The Central School, started in 1883, was the first English school in the Malay States and house its first 1 students. It was renamed the King Edward VII National School when in conjunction with the coronation of England's 7th King in 1901. During the Japanese occupation,the school was the base of the garrison commander who converted the classrooms into torture chambers and dug up the playgrounds to grow food." St Georges' Institution. Taiping. " The Catholic boys' school was established in 1915 and 13 years later the original building was extended with a wing on each side. During the Japanese Occupation, the school served in turn as Nippon-Go Gakko (Japanese school), Kempetai (Japanese military police) base and Japanese officers' hotel." Convent Taiping. ' In 1889, the first convent was started in nearby Klian Puah by three sisters from the convent in Penang. The class and orphanage in Taiping were upgraded when the present school building at Kota Road opened in 1938. In May 1941, the British requisitioned it for a large military hospital but in December it was taken over by the Japanese. Towards the end of war, the Taiping Convent became the headquarters of the Japanese military administration, the Gun-sei Kan-bu." King George VI Seremban. In 1941, the school premises were taken over by the Australian Imperial Forces. During the Japanese occupation, the school was used as the Japanese Military Police Headquarters by the Miyazaki Butai regiment. The dressing room beside the stage in the school hall were reportedly used as torture chambers. After the Allied reoccupation, the British army maintained a military hospital in the school for a further 6 months. SMK Tinggi Kajang is reported to be one of the oldest schools in the country. During World War II, it was used by the Japanese army as a burial site. Clifford School (formerly Anglo-Chinese School) Kuala Lipis. During the Japanese Occupation, the school became the military headquarters of the dreaded Japanese secret police, the Kempetai. The Japanese torture chamber built within the school compound was still standing. However, it was demolished in the 1980s, perhaps after too many a ghost story scared the school kids? I am interested in which buildings were used by the Japanese in Kuantan, Pahang, and any information regarding the airfield next to the beach at Kampung Cempaka, Kuantan (formerly Kampung lapangan Terbang Lama = old airfield village).